It’s a question every business owner must ask themselves regularly: how profitable is my business? Do you even know how much profit you created this month? Profitability is a measurement of efficiency, and ultimately its success or failure! 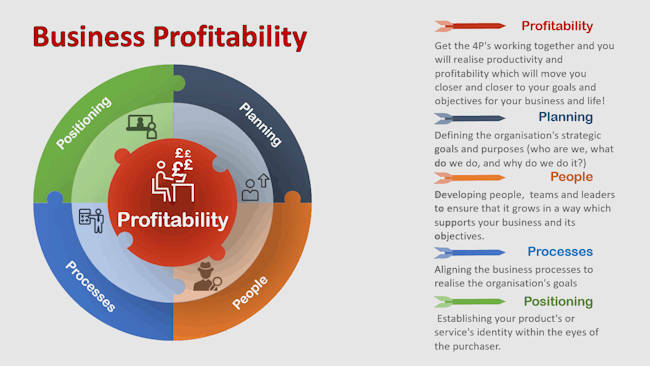 Get the 4P’s of planning, people, processes and positioning working together and you will realise productivity and create profitability which will move you closer to your goals and objectives for both your business and your life! Many owners and managers have never been taught this concept and the importance of key financial terms and business processes. Surveys reveal a gap between financial ‘confidence’ and ‘competence’, which can be critical to an organisation’s performance. So what is profit? It is simply the state (or condition) of yielding a financial gain in an enterprising activity after all of the expenses are paid. Typically, when I first interact with a new client, their focus is on turnover. They frequently tell me “I must get more clients to make more money”. Very often this is far from the truth and, surprisingly enough, it may well be that they need to actually get rid of some of their clients! And then ‘sack’ all of the Grade D clients who are low profit and high maintenance. The best and easiest way to do that is to increase your prices! You will be extremely surprised how much productivity and profitability can literally grow overnight! Not the one that is your accountants favourite, but the one that really fits your personal need, one that you can easily access on a daily basis, one that you understand and one that assists you in your forecasting and financial planning. Some of the comments I hear time and time again after working on the profitability of an organisation are, ”I can now sleep at night”, ”This is so easy! I now understand where all my money is coming from and going to”, ”It is now fun to forecast and plan for the future” and ”I wish I had known you years ago and taken control much sooner”. In a competitive marketplace, it is important that you learn how to achieve a satisfactory level of profitability. Increasing profitability involves determining which areas of your financial strategy are working for you and which ones need improvement. Finance used to be just about numbers in rows and columns. Now it is easy to realise the potential, to use new analysis tools, and to actually see the trends, the story, and the power that data brings. That’s where I can help. I can coach and mentor you to make profitability-driven decisions. I’ll introduce you to my trusted partners who are all experts in their field and take a modern approach to business intelligence. If you’d like me to work with you and your team to ensure you are following my 4P programme which will move you toward profitability then do call me on 01280 700405 or click here to send me an email enquiry and let’s start a conversation. Profitability is closely related to profit, but it is the metric used to determine the scope of a company’s profit in relation to the size of the business. Profitability is a measurement of efficiency, and ultimately its success or failure. It is expressed as a relative, not an absolute, amount. Profitability can further be defined as the ability of a business to produce a return on an investment based on its resources in comparison with an alternative investment. Although a company can realise a profit, this does not necessarily mean that the company is profitable.